Dignity is concerned with how people feel, think and behave in relation to the value of themselves and others: To treat someone with dignity is to treat them in a way that is respectful of them and as valued individuals. In a care situation, dignity may be promoted or lessened by physical environment, organisational cultures, attitudes and behaviour of the care team or others. When dignity is present, people feel in control, valued, confident, comfortable and able to make decisions for themselves. Zero tolerance of all forms of abuse. Listen to and support people to express their needs and wants. Assist people to maintain confidence and positive self-esteem. The Dignity in Care program aims to change the culture of care services by reinforcing the importance of treating people with dignity and respect. The program was launched for the first time in Australia in early 2011 at The Queen Elizabeth Hospital (QEH). Maggie Beer is the Dignity in Care program patron. In South Australia, 300 enthusiastic champions are already enlisted in this program at the QEH. Dignity in Care is modelled on a United Kingdom program launched in 2004 that now has more than 26,000 dignity champions. 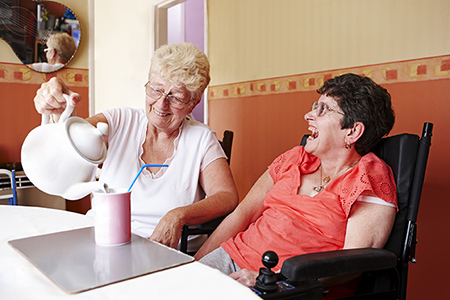 Dignity in Care is supported across Disability Services with over 100 Dignity in Care Champions including residents, family and friends, and staff taking on this important and rewarding role. Dignity champions believe ensuring dignity and respect for people using care services is worth pursuing. To dignity champions, being treated with dignity isn't an optional extra – it's a basic human right. Champions assert that it is not enough that care services are efficient; they must be compassionate too. Champions strive to work in partnership with care providers to improve the quality of all services. A dignity in care champions' roles will vary according to their knowledge and the type of work in which they are involved. There are many small things a champion can do to have a big positive effect on people's lives. Champions can choose how active they want to be, and there are no requirements that need to be met. Simply providing feedback on good or bad care with a note to staff, for example, is being active in the role of a dignity champion. In-service training provides workplace champions with the knowledge and skills to guide others in promoting the 10 Dignity in Care principles within their area. Email paul.glaze@sa.gov.au if you would like to become a champion or need further information.